With huge windows and plenty of open space, the mezzanine in Terminal 1 provides the best airfield views at Minneapolis-St. Paul International (MSP). And until recently, 5,000 square feet of the prime airport real estate was used for storage. Lounge Size: 5,000 sq. ft.
Late last year, however, MSP began leveraging its second-story asset to create a new “luxury amenity.” It now leases the mezzanine space to MAG USA for an upscale common-use passenger lounge. MAG USA is the U.S. subsidiary of U.K.-based Manchester Airport Group, which owns and operates four British airports, including Manchester Airport and London Stansted Airport. Today, the room-formerly-known-as-storage-space is a newly appointed spot for weary travelers to rest, eat and recharge. “I think it makes us a much more attractive option,” says airport spokesperson Phoebe Larson. Because MSP serves a great deal of business travelers, yet also accommodates many families, officials strive to offer amenities that appeal to everybody, she explains. The lounge, which opened in mid-December, is designed to benefit orgination/destination and connecting passengers alike. While local travelers may come early to dine at the lounge before their flights, other passengers will benefit, too, notes Larson. “When you have a long layover and you’re in an airport with more amenities, you are happier,” she explains. MSP’s Escape Lounge is open to any traveler on any airline for a daily rate of $40 pre-booked online or $45 at the door. As such, it offers an alternative to airline lounges that typically require annual subscriptions or the purchase of premium class flights. While Delta Air Lines has a large presence and lounge at MSP, the airport wanted a similar option for travelers flying on other carriers as well as Delta fliers who don’t have a membership for the airline-specific lounge. The Escape Lounge’s daily fee includes high-speed Wi-Fi coverage, free use of iPads and printers, and quiet areas to read or relax. Complimentary drink options include premium coffees, Fiji water, sparkling waters, and select beers and wines. Breakfast, lunch and dinner are served, as well as snack foods throughout the day. Larger meals are available for an upcharge. MAG USA partnered with airport concessions veteran HMSHost to supply food and beverages for the lounge. A company chef reviews the menu regularly and sources everything for the kitchen from standard staples to aeroponic salads and herbs. To mitigate noise and distraction from the outside terminal, designers equipped the lounge with a sound-lock vestibule. With the number of passengers growing at U.S. airports, it can sometimes seem impossible to escape the cacophony of sounds within a terminal to make a phone call, have a quiet conversation or soothe a headache, note MAG personnel. In addition to MSP’s new Escape Lounge, MAG also operates five similarly branded facilities in the U.K. airports it operates. Andolino joined the company last year, after serving as commissioner of the Chicago Department of Aviation, where she oversaw the management and operation of O’Hare and Midway International Airports. Andolino reports that MAG USA invested $2 million in the Escape Lounge at MSP. The facility can accommodate up to 140 passengers, and personnel will monitor admission numbers closely to avoid overcrowding, she notes. While the company is considering membership and loyalty programs, executives plan to stick with the current daily entry model for now. Engineering giant Jacobs designed the lounge with separate spaces for various uses. Some areas are designed to cocoon, some to reflect and some to socialize, explains the company’s senior project designer, John Trosino. Jacobs also translated what MAG had already developed in its U.K. lounges for the U.S. market. “We had to adjust some of the materials for the American market; but the MAG Escape brand is strong, and that made it easier,” he notes. Project planners felt it was important to provide visibility into the lounge for potential customers, so they consequently highlighted the space’s transparency. For tenant spaces directly on the concourse, designers often use a combination of patterned and clear glass to attract passengers inside; but they used almost all clear glass for the lounge’s entryway and windows, explains Trosino. Trosino and his team consequently lined the entire entry wall with mirrored panels to give it the illusion of a wider space. Signage, which is expected to be complete in March, will further help direct travelers’ eyes up toward the second-story lounge. 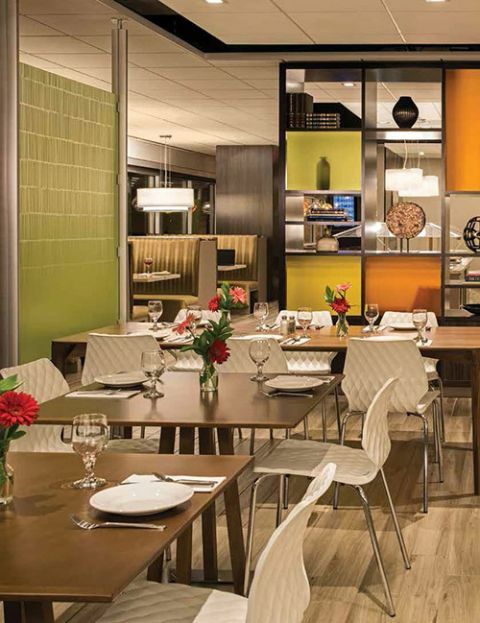 MAG plans to add a similar slice at Oakland International Airport, where it is partnering with Jacobs in building out a smaller Escape Lounge, which is scheduled to open later this year. During February, MSP’s Escape Lounge discounted its entry fees to $25 at the door and $20 when pre-booked online. If you mention reading about the facility in Airport Improvement magazine, the lounge will extend its introductory prices through the end of March.